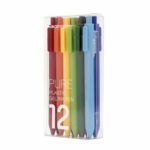 The multifunction pen incorporates 3 color gel pen and a 0.5mm lead pencil, allowing you to write and paint smoothly and conveniently. Pocket pen clip design makes it portable to carry for everyday use, perfect for home, office, school and more. 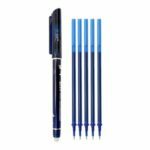 The signature pen is equipped with 3 color gel ink pen and a 0.5mm lead pencil, suitable for office, home or school use and more. Featuring 3 color gel ink including black, blue and red to meet your daily writing or marking needs. 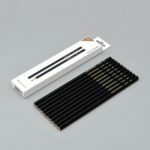 Imported 0.5mm refill allows you to write smoothly, not easy to infilter into paper. The multifunction pen incorporates a 0.5mm lead pencil which is not easy to break, letting you write and paint with ease. Precise retractable module enables you to switch between different colors easily. Convenient for every day use. You can easily replace refill for reuse, eco-friendly and economical. 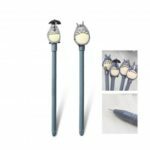 Pen holder adopts imported MILLION GUARD hard gel, erosion-resistant and anti-slip, comfortable to hold. Weighing only 15.4g, lightweight hand feeling will make your writing more relaxed. Designed with a eraser on the top of the pen, convenient for erasing unwanted content anytime anywhere. Clip-on design pen clip, perfect to clip on paper or pocket, convenient for carrying around.